Farewell George Lopez!!! 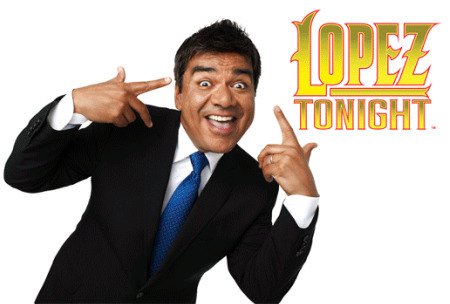 TBS Cancels ‘Lopez Tonight’!!! That’s right, TBS has officially cancelled the George Lopez talk show ‘Lopez Tonight’. This was eventually going to happen. It was just a matter of when. TBS wanted to cancel the show back when Conan O’Brien came to the network, but Conan insisted that Lopez stick around. Most likely because Conan did not want to be the guy who got rid of Lopez. I’m sure Lopez will land on his feet. Best to him. ‘Meet The Blacks’ Comes To Blu-ray & Digital HD!!! Bruce Campbell Will Host Horror Themed Game Show ‘Horrified’!!! This entry was posted on Wednesday, August 10th, 2011 at 2:30 pm	and is filed under Film, News. You can follow any responses to this entry through the RSS 2.0 feed. You can skip to the end and leave a response. Pinging is currently not allowed. « Geek Image of the Day!!! ‘Sesame Street’ Meets ‘Fear and Loathing In Las Vegas’!! !